A graduate hugs a presenter at the School of Dentistry's commencement ceremony May 18 at the George R. Brown Convention Center. Photo by Brian Schnupp. 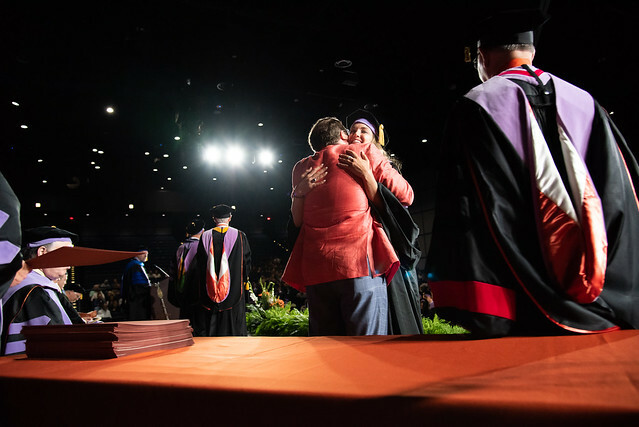 More than 160 students became graduates of UTHealth School of Dentistry at Houston as the school held its 113th commencement convocation May 18 at the George R. Brown Convention Center. Keynote speaker N. Karl Haden, PhD, president and CEO of AAL, encouraged the graduates to practice honesty, humility and hope along with practicing health care. Dean John Valenza, DDS, encouraged the Class of 2018 to follow in the footsteps of previous UTSD Houston alumni. UTHealth President Giuseppe Colasurdo, MD, and other university leaders attended the ceremony, which also included comments from DDS Class President Mitchell Mactier and Dental Hygiene Class President Michelle Anderson. The ceremony was streamed live on Facebook and will be posted on the school’s YouTube channel next week.